Artist Interview Borbay. 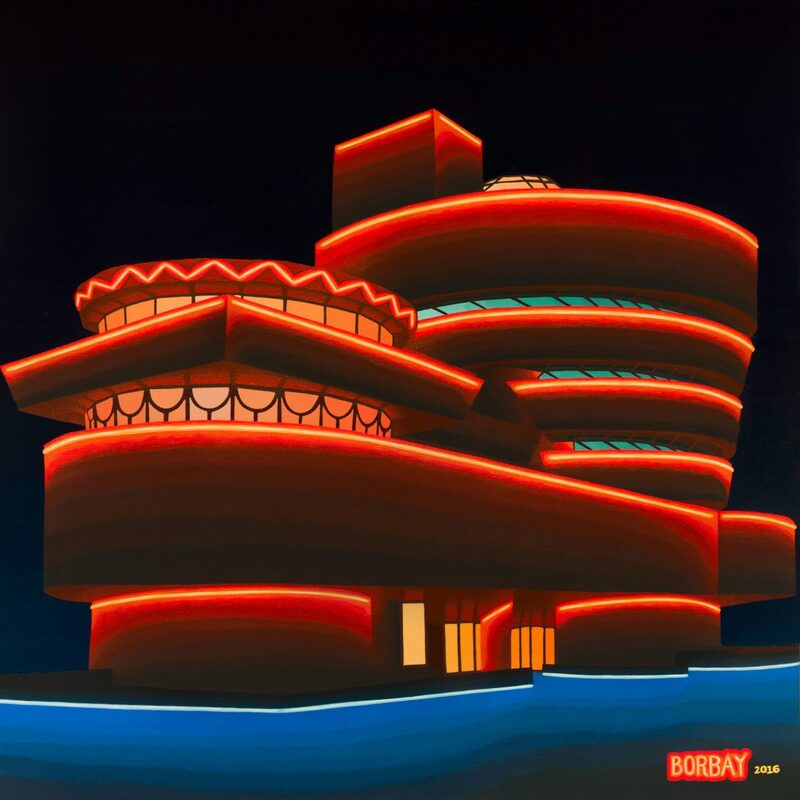 A dyed-in-the-wool artist, Time Out magazine even referred to Borbay as among NYC’s “Most Creative New Yorker[s]”. One of his assemblage pieces incorporating multiple New York Post headlines became an irl New York Post headline. And, In true NYC artist fashion, Jason has been painting on NYC’s city streets most of his career. 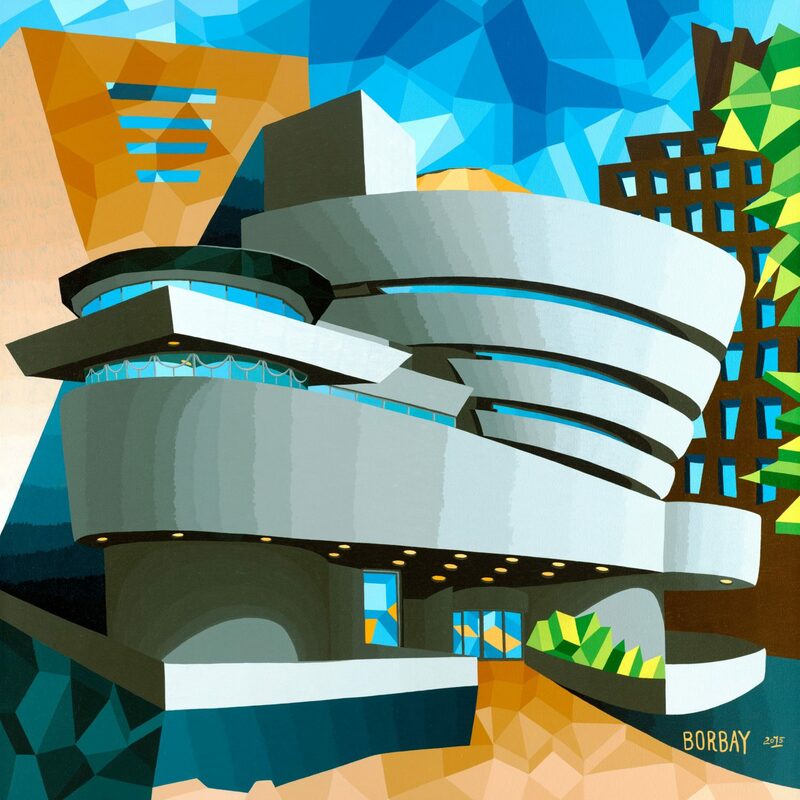 The Guggenheim edifice is one of his regular subjects. He has painted it on site every year for 20 years. He was Art Exuma’s first AIR* in the Bahamas while back in the states, judges from Sotheby’s, Gagosian, and Christie’s curated his work to show in NYC’s Accessible Art Fair. Recently, Jason enjoyed a solo exhibit at The Art Association of Jackson Hole, and, was a fellow at the Four Seasons Jackson Hole AIR program. In 2018, he was the featured artist at the Wyoming Governor’s Conference, and, lastly, is a current AIR fellow at Teton Springs. What is your subject matter all about? After a while, for about three years, I’ve been focusing in two areas — collage painting portraits and neon Recently, I began combining the two by placing silver screen cowboys in NYC scenes. Namely, Gary Cooper from The Westerner in front of the Seinfeld Diner; and Clint Eastwood from The Good, The Bad and The Ugly. These collaged portraits represent the sum of the subjects parts. At first glance, one sees a person. The next thing one sees, is who the subjects are. As for the neons — I’ve been in love with low light for as long as I can remember. This, combined with my interest in graphic design, make these signs irresistible. What colors are on your palette right now? It’s been a black-and-white start to 2019 with three portraits created in this palette. The latest, a portrait of collector Patricia Barganier, was a delight to bring to life. I’m beginning a 48 X 96” canvas at the moment, my largest to date. Explain your fascination with your preferred canvas size and why. I’ve been onto the square canvas for some time. In like fashion with all artists, everything is stolen from somewhere. In this case, I helped myself to Warhol’s square portrait format. Tell us a little but about how you market your work? So, I’ve self-represented since 2009. My career began in the streets of Manhattan where I’d set-up my easel and speak with anyone who asked about what I was doing. From there, I’ve transitioned into more of a studio artist, leveraging social media like many artists. Since then because my market and prices have grown, I have reduced my social imprint, focusing on building relationships with my collectors. What else do you want us to know about you? I’m a proud father of three amazing kids and husband to my wife, Erin. When I’m not painting in my studio, you’ll easily find me playing hockey in my league, or golfing at Teton Springs. Jason Borbay was interviewed by fine art Wedding photographer NYC Angela Cappetta.